After the surrender of Spanish General Leopoldo Garcia Pena in Cavite, neighboring provinces also fell to Filipino troops. The momentum of the revolution was unstoppable in the whole of Luzon. Manila was under siege, surrounded by Filipino trenches and fortifications; cut off from its arabales (suburbs). On June 5, revolutionary leaders started preparation for the declaration of independence. 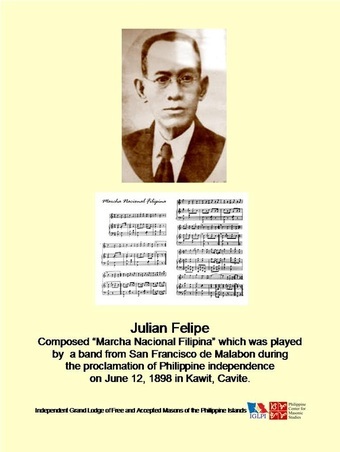 Julian Felipe was tasked to compose a national march; Ambrocio Rianzares Bautista authored the "Act of Declaration of Independence." 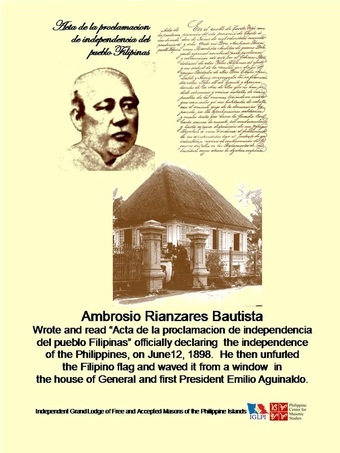 Independence was declared at Aguinaldo's house on June 12, 1898. Gen Aguinaldo then proceeded to appoint the first diplomatic officers to work for the recognition of Philippine independence. His adviser, Apolinario Mabini prepared decrees for the election of representatives to a national assembly,later known as the Malolos Congress. After the declaration of independence on June 12, 1898, General Emilio Aguinaldo's revolutionary government started preparations for a post-revolutionary period. Local governments were reorganized, Filipino diplomats were appointed, and a national budget was prepared. Schools were reopened and new schools, including a university, a high school and a military academy were established. Aguinaldo through his chief adviser, Apolinario Mabini issued a decree calling for an election of representatives to a popular congress; later known as the Malolos Congress. This congress convened on September 15, 1898 at Barasoain church. It drafted a constitution which was promulgated on January 21, 1899; establishing a republican form of government. Philippine Republic was inaugurated on January 23, 1899, the first republic in Asia. Emilio Aguinaldo rose to prominence as a revolutionary general when he led his army of volunteers, the Magdalo troops of the Katipunan, in a series of victories in Imus, defeating the better armed and trained Spanish forces. He was later elected in absentia as president of the revolutionary government that replaced the Katipunan. The split caused by the formation of a government, the arrest, trial and death of KKK Supremo Andres Bonifacio resulted in the weakening of revolutionary forces. As a result of the truce of Biak-na-Bato, Aguinaldo agreed to self-exile in Hong Kong. He returned at the beginning of the Spanish-American war in 1898 to resume the revolution against Spain. His victories led to the declaration of independence on June 12 and the subsequent formation of a new government. A representative assembly, the Malolos Congress, promulgated a republican constitution on January 21, 1899. On January 23, the Philippine Republic, the first republic in Asia was inaugurated. General Aguinaldo was made a Mason in Imus, Cavite at Logia Pilar No. 203, of the Grande Oriente Español on January 1, 1895. Marcelo H. del Pilar started his active nationalistic crusade after obtaining his license in jurisprudence in 1880. To reach the masses, he published Diariong Tagalog in 1882. His participation as the alleged author of the anti-friar petition during a mass demonstration in 1888 and as a lawyer, his successful defense of its leaders made him a target of persecution. In 1889, he sailed for Spain as delegate of the Comite de Propaganda where, along with other Filipino expatriates, he continued his fight for reforms. 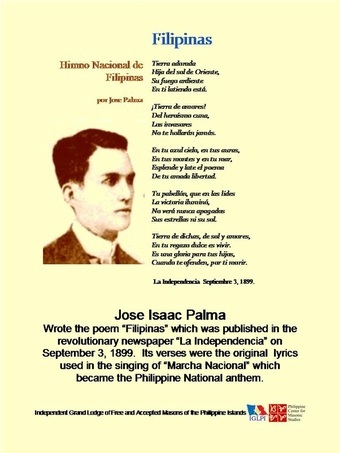 He succeeded Graciano Lopez-Jaena as editor of the propaganda newspaper La Solidaridad. He became a Mason in 1889 and became a close friend of Miguel Morayta a professor at the Universidad Central de Madrid, president of the Asociación Hispano-Filipino and Grand Master of Masons of the Gran Oriente Español. He served as Worshipful Master of Logia Solidaridad No 53 in Madrid and was responsible for the official authority granted by Morayta to establish Filipino lodges in the country. By 1891, the first Filipino lodge was constituted, affiliated by the Gran Oriente Español as Logia Nilad No. 144 in 1892. From here came other Filipino Lodges. In 1893, it was again del Pilar who obtained for the Filipino Masons, the approval for the establishment of the Gran Consejo Regional de Filipinas, the first national organization of Masons in the Philippines. For all his efforts, he is considered as the Father of True Filipino Masonry. Apolinario Mabini is best known in Philippine history books as the “Brains of the Revolution” and “the Sublime Paralytic”. A reformist by conviction, he opted to join the moderate Cuerpo de Compromisarios after the dissolution of Rizal's La Liga Filipina and continued to support the Propaganda movement in Spain. He joined Logia Balagtas No.149 of the Gran Oriente Español in the Philippines on September, 1892 and adopted "Katabay" as his symbolic name. Mabini was falsely associated with the Katipunan uprising and arrested in 1896, together with Numeriano Adriano, Moises Salvador and other Liga Filipina members. He was later released but other Liga members were executed and became known in history as the 13 Martyrs of Bagumbayan. This was the turning point in his patriotic life. He joined the renewed revolution in 1898 and in spite of his infirmity, was made the chief adviser of Emilio Aguinaldo until the reorganization of Aguinaldo’s cabinet in 1899. The nation celebrates the birth anniversary of Dr Jose Rizal every June 19. He is known as the greatest Filipino who ever lived; a genius who in his short lifetime became a medical doctor , opthalmic surgeon, a poet, sculptor, artist, cartoonist, naturalist, linguist, ethnologist and an expert in other fields. But he is best known for his Noli Me Tangere and El Filibusterismo: two novels that awakened the nationalist spirit of the Filipino. For these he was ruthlessly persecuted together with his family. He died a martyr on December 30, 1896. Rizal was a Mason and many believe, he never retracted and died as one. General Aguinaldo who was himself also a Mason revered his greatness. It was Aguinaldo, not William Howard Taft's Second Philippine Commission who first recognized Rizal as a national hero, as evidenced by the former's decree of December 20, 1898. Filipino Masons played an important role in the 1896 Philippine revolution against Spain. The Katipunan secret society was founded by Masons Ladislao Diwa, Andres Bonifacio Teodoro Plata, Deodato Arellano, Valentin Diaz and Jose Dizon after Rizal's arrest in July 1892. With the belief that reforms were no longer attainable, the new organization advocated total separation from Spain. The subsequent recruitment of members and establishment of many chapters of the Katipunan did not escape the Spanish authorities. Suspecting that the secret society was actually that of Freemasonry, Masons were placed under surveillance and persecuted until lodges could no longer meet regularly. This counter measure only drove more Masons to eventually join the Katipunan. In the city of Cavite (Cavite Puerto) capital of Cavite province, of the thirteen martyrs executed at the outbreak of the revolution, ten were Freemasons. They were Maximo Inocencio, Jose Lallana, Eugenio Cabezas, Maximo Gregorio, Hugo Perez, Alfonso de Ocampo, Luis Aguado, Victoriano Luciano, Severino Lapidario and Feliciano Cabuco. The non-Masons were Francisco Osorio, Antonio de San Agustin and Agapito Conchu. They were executed on September 12, 1896. Before his return to the Philippines, from exile in Hong Kong, General Emilio Aguinaldo gave Doña Marcela Mariño de Agoncillo a design of a flag that would serve as the symbol of the country and unite the Filipinos. Doña Marcela, her daughter Lorenza and Delfina Herbosa de Natividad, niece of Dr. Jose P. Rizal skillfully sewed what was later to be known as The Sun and the Stars - the Philippine Flag. Doña Marcela's husband was Don Felipe Agoncillo, the appointed diplomatic agent of General Aguinaldo to the United States who tried to present the Filipino cause against American annexation during the deliberations of the "Treaty of Paris" but was not permitted. General Aguinaldo was a firm adherent of Masonry thus, it has been claimed that many of the flag's symbolisms were Masonic in nature and inspired by symbols and décor of Spanish Grand Orient lodges. 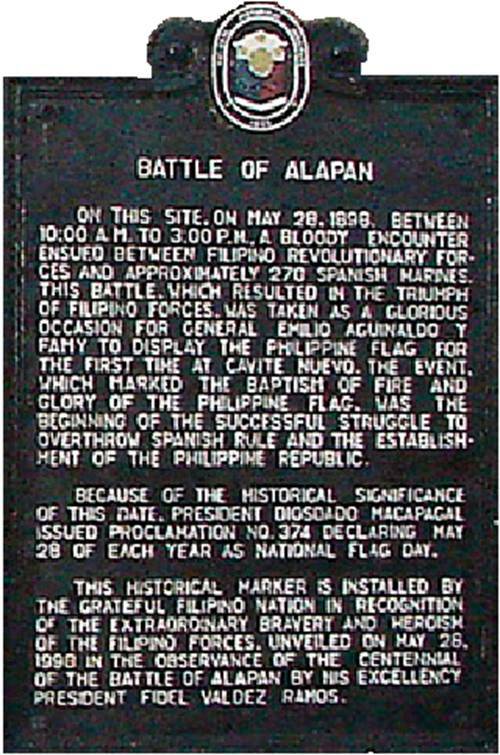 On May 28, 1898, after the decisive victory of Filipino soldiers in Alapan, Imus, Cavite, Spanish prisoners were presented to Aguinaldo at his headquarters in Teatro Caviteño in Cavite Puerto (Cavite City). Elated, Aguinaldo brought out the Philippine flag and waved it for the first time, in front of a large crowd. 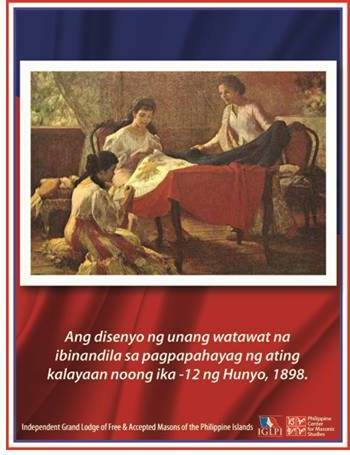 May 28 commemorates the first unfurling of our national colors, the Philippine flag. Flag Day is prescribed under Section 26 of Republic Act 8491 of 1998: "The period from May 28 to June 12 of each year is declared as Flag Days, during which period all offices, agencies and instrumentalities of government, business establishments, institutions of learning and private homes are enjoined to display the flag."